There's nothing like watching the thrill of a last second shot hitting nothing but net as time expires. The crowd goes nuts and emotions run wild. The only thing better than seeing it happen is seeing it happen while enjoying amazing party food at the same time. The big college basketball tournament is in full swing and it has been exciting to watch. Chances are you have been invited to a party, are throwing one yourself, or are watching the games with a few friends. It is illegal to do any of this without good food, well, at least it should be. This is where my Buzzer Beater Bacon Buffalo Wraps recipe comes in. I entered the #FrozenChefMadness contest from EasyHomeMeals.com and LifeOfDad.com a couple of weeks ago. It's National Frozen Food Month and we were tasked with the challenge of building a great recipe that is both simple to make, and takes little time in the kitchen. This is so you can spend more time watching your favorite team win. My recipe for Bracket Buster Breakfast Sliders made it to the Elite Ate and then amazingly the Final Fare! You can see the recipe HERE. This meant I needed to come up with yet another recipe to propel me to the championship. Since this is for National Frozen Food Month, I needed to pick three more frozen foods to make the delicious winning combo. There are so many delicious options in the frozen food aisle, it was hard to choose! 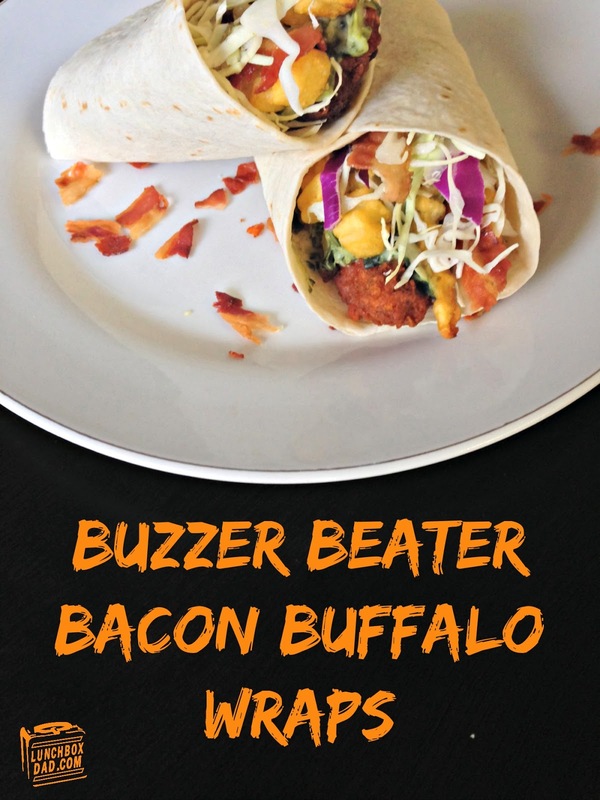 I believe I found the right mix of flavors with my Buzzer Beater Bacon Buffalo Wraps. These things seriously will make your mouth water and your taste buds give you a high five. The great thing about them is that they are so versatile and quick to make. Every hot ingredient can be heated in your microwave, which gives you more time to cheer for your team! The wraps can be cut into large pieces if you are just feeding just a few people, or they can be sliced liked sushi and arranged on a party tray. 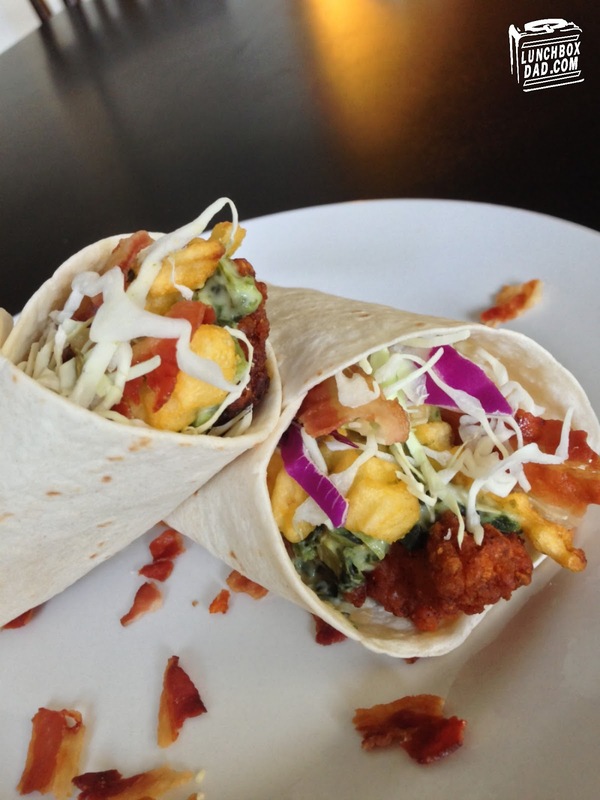 You will be your party MVP if you make these! 1. It is very important that you heat the ingredients in the microwave in this order, according to package instructions: cheese dip, chicken strips, french fries, and bacon. 2. Once all ingredients are heated, place 1-2 chicken strips across middle of tortilla. Spoon desired amount of cheese dip on top of chicken. Put french fries on top of cheese dip and bacon strips on top of fries. 3. Spread coleslaw mix on all of the ingredients. You can get a bag of it, with the other bagged salad, in the refrigerated section of the store. Do not mix the coleslaw with the dressing. 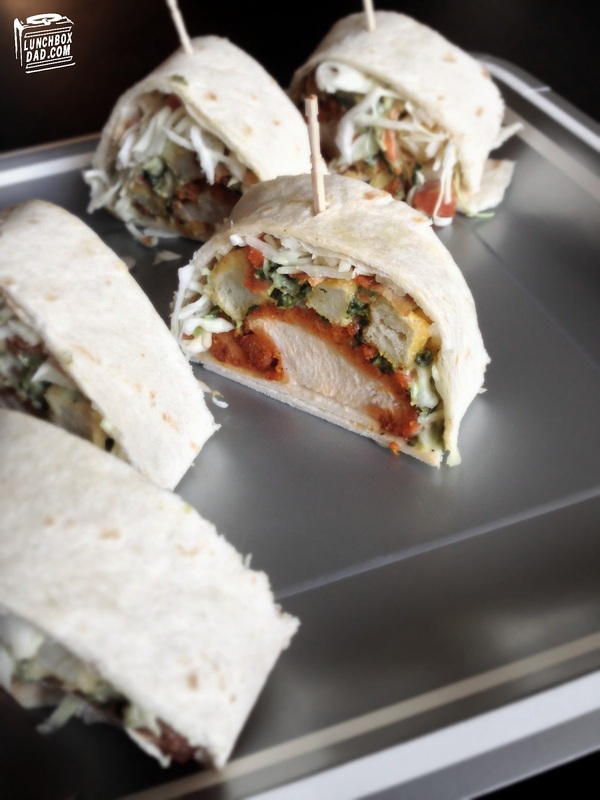 The coleslaw, along with the french fries, bring crunch and a nice texture to the wrap. 4. Tightly wrap ingredients in tortilla. If making larger wraps, use a sharp knife to cut down the middle, and put a toothpick in each piece. If making a sushi sized pieces, as in the picture above, slice thin pieces off of wrap and insert a toothpick into each piece. Have a fun time watching the rest of the basketball tournament and I hope your bracket is doing better than mine! 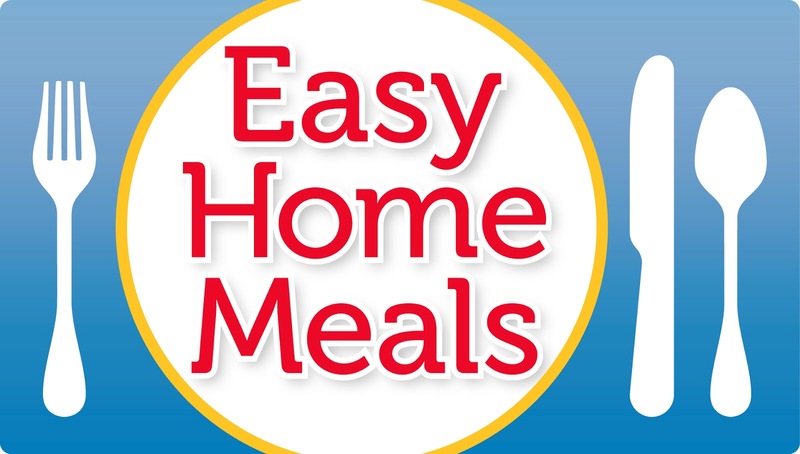 Be sure to watch for the winner of the #FrozenChefMadness contest on EasyHomeMeals.com.